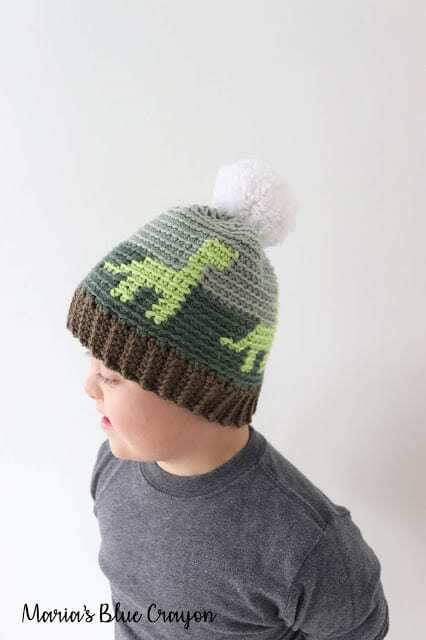 Scroll down for the Free Crochet Dinosaur Hat Pattern for kids! Whew! Can I just start by saying this crochet hat was a doozy for me to design? 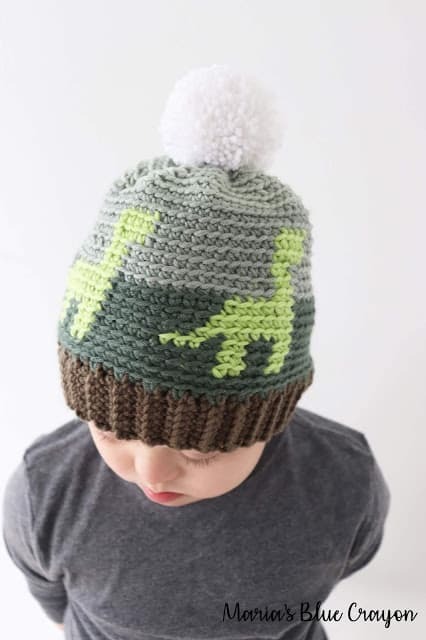 I knew exactly what I wanted for this crochet dinosaur hat to look like, but it didn’t turn out the first time or the second time.. or the third time.. or the fourth time. 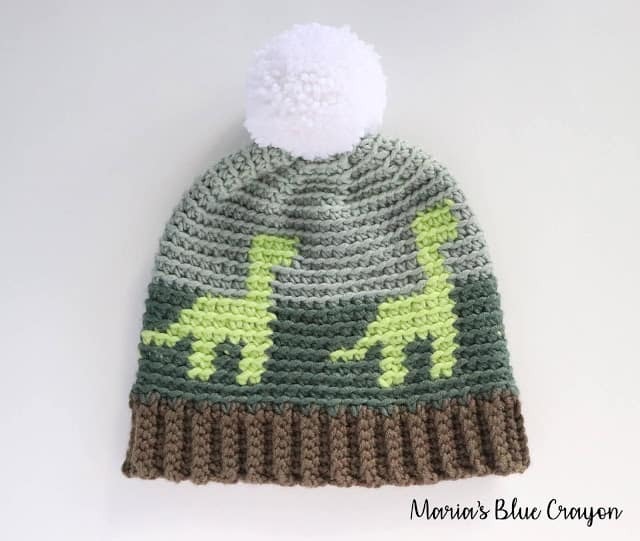 I think I lost track of how many times I crocheted and frogged this dinosaur hat! The look was spot on, the problem was the overall fit of the hat. My main goal for this crochet hat was to use just ONE skein of the new Caron x Pantone yarn. I got the yarn as soon as it hit stores in October. It is now December and yes, it took me that long to design this dinosaur crochet hat so I hope you love it as much as I do! I was insistent on doing the waist coat/knit stitch, but I came to terms after the third try that it was just not stretchy enough and I didn’t want this hat to be too rigid. No matter what I did, I couldn’t get the stitching to relax. So I moved onto just a regular single crochet in the back loop only so the stitches would (for the most part) line up one on top of the other for the dinosaur graph to look nice. After a few more attempts and me actually recreating a whole different graph then going back to the original graph.. I give you the crochet dinosaur beanie. I have to say it was worth all the hard work because I absolutely love it and so does Trevor! Anyway, I hope you enjoy this design. I have the graph below for you follow and there are a number of times you have to change colors but with the hat being so small, it’s a very doable project. I was able to get the final version cranked out in a few sittings. All in all, it’s a fairly simple hat with color work. The brim is worked first then the main body of the hat is crocheted with the color work and graph. There is also some shaping at the top of the hat so there are no large holes to close up at the top. I added a yarn pom pom as an extra, but that is optional. If you would like the written version of the graph (Round 1: 4 green, 2 light green, 2 green, etc.) that will be available in the PDF that you can purchase on Ravelry. Thank you for the support! PURCHASE THE AD-FREE PDF ON RAVELRY. GRAPH AND WRITTEN VERSION OF GRAPH INCLUDED. Thank you so so much for your support! Without it, I wouldn’t be able to homeschool Trevor and have him work along side me! Sharing in any way helps my blog flourish! Thanks so much! 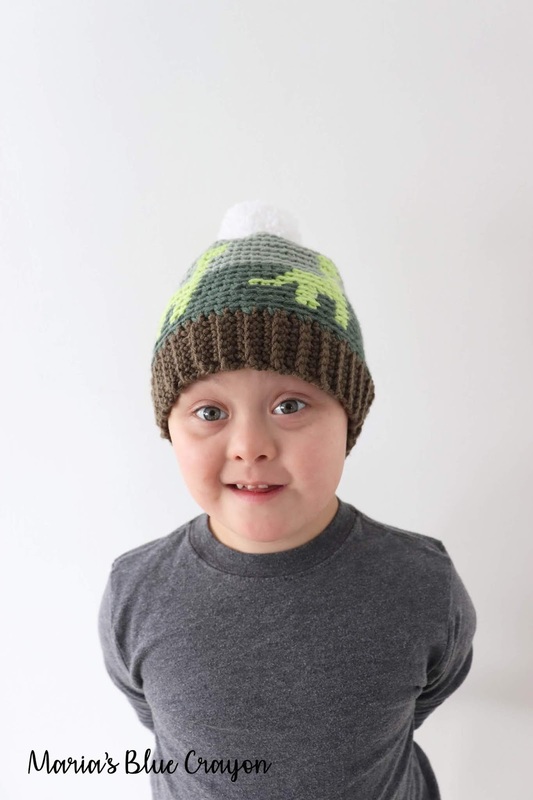 The hat will be made by crocheting the brim first then moving onto the body of the hat. For the color work, use the bobbin technique or cut yarn after each color change. I have found that carrying the yarn made this hat not very flexible or comfortable to wear. The color work/graph will be made using single crochets in the back loop only. The Caron x Pantone yarn will have 5 different sections in the braid. I refer to the colors as the following: brown, dark green, lime, blue, and light blue (this is the order they are in the braid/skein). This hat size is for toddler/child. Dimensions: 18” around, 8” in height without pom pom. Hat will stretch to accomodate 20” head for child. Checking your gauge is important to make sure this hat does not come out too small. Slip stitch Row 1 and Row 60 together. This will complete the brim. Rotate work so you are working on the side of the single crochet rows/brim. We will begin to start our color work and follow the chart below. All the stitches will be sc in back loop only. Join to first sc after each round and Ch 1 to begin each round. Ch 1 will not count as a stitch. Follow the chart starting at the bottom right corner. Since we will be working in rounds, continue to read the graph from right to left instead of back and forth. If you would like the written out graph (Round 1: 4G, 2L, 2G, etc) that is available in the paid PDF version on Ravelry. 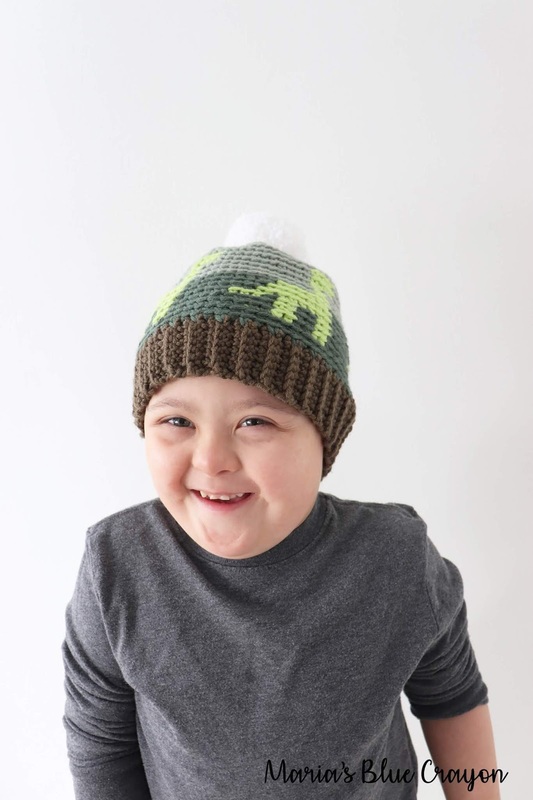 Once the chart is complete, you will have a total of 15 rounds including the first round of single crochets in dark green that we crocheted to start the main portion of the hat. We will now change colors to the lighter blue and start to decrease to shape the top of the hat. Fasten off and weave through top stitches to close top of hat. Optional: Make yarn pom pom and attach to the top.